Check out the Gun Freedom Radio’s Videos! We here at Gun Freedom Radio don’t just talk guns, we LIVE guns! We load all our videos here, check back regularly to see what we have been up to! Cheryl Todd talks about “Ordinary Warriors” on The Better Half panel at Second Amendment Foundations (SAF) 2017 Gun Rights Policy Conference (GRPC) in Dallas, TX. Excerpt: “Why are we always so surprised when we stop to notice how powerful the feminine side of our natures are? I ran across an article about an archeological find of the grave of a female Viking Warrior. The find was noteworthy BECAUSE the remains are female. One of MY greatest strengths is actually how ordinary I am. I am any-woman. I am that 5’5”, over 30 woman just like our lady Viking. I am a wife of 33 years. I am a business owner. I am a mom. And I am a grandma. This ordinary-ness is empowering to other women who are part of this (almost-secret) sister-hood of Patriots, and it is terrifying to those whose life-mission is to put others under the thumb of tyranny and Big Government. For more of this speech please click the video which features: Cheryl Todd, Robyn Sandavol, Sarah Cade, Rachel Malone, and Paloma from Defense Distributed. To view the segment that our co-host Cheryl Todd, and fellow DC Project Delegate, Clover Lawson, presented on the “Update on the DC Project”, click here. The entire Sunday Program of the 31st Annual Second Amendment Foundation’s Gun Rights Policy Conference can be found here. The 31st Gun Rights Policy Conference (GRPC) in Tampa will be live streamed on the conference days – Sept. 24 and Sept 25, 2016. Please tell your family and friends that they can watch and listen from wherever they may be. This link will be active from 8:30am – 1:pm EST on Sunday, September 25th. Come meet national gun rights leaders and your fellow grassroots activists at the 31st Annual Gun Rights Policy Conference (GRPC 2016) in Tampa, Florida at the DoubleTree by Hilton on September 23, 24, & 25, 2016. 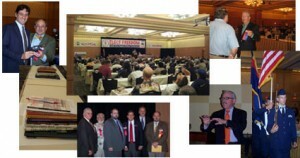 This is your once-a-year chance to network, get an insider look and plan pro-gun rights strategies for the coming year. Past GRPCs have outlined victory plans and made public the latest firearms trends. They allow you a first-hand chance to hear movement leaders–and make your voice heard. This year we’ll take a look at critical issues such as: city gun bans, “smart” guns, concealed carry, federal legislation, legal actions, gun show regulation and state and local activity. You can see the full list of speakers and events here. This link will be active from 8:am – 6:pm EST on Saturday, Sept 24th. 50 women, one from each state, gathered on the West Lawn of the Capitol Building for The DC Project Rally on Friday, July 8, 2016 to share why the Second Amendment is important to them. The DC Project is a nonpartisan, grassroots initiative to encourage women to establish relationships with their legislators, and reveal the faces and stories of firearms owners and 2nd Amendment supporters. 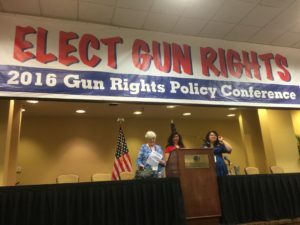 One of the Speakers, Cheryl Todd, is a gun store owner, of AZFirearms.com, and talk radio host of Gun Freedom Radio, but more importantly she is a wife, mother and grandmother.